With Spots & Specks Charter Fishing, you only need to show up at the dock - we handle the rest! 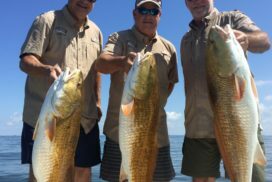 You get a beautiful day on the water customized to fit your needs, whether it's sight-fishing the "reds" or fly fishing for the veteran sportsman. We specialize in speckled trout and redfish, but we also offer shoreline fishing, from the beach line to close rigs. Your captain is Coast Guard Licensed & has over 25 years of experience fishing South Louisiana waters. His knowledge of the waterways and local fish behavior guarantees that you get the most for your money! 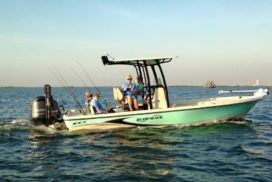 All fishing is done in this beautiful 24-foot Blue Wave Purebay fishing boat with all the extras! Captain Eddie was amazing! My first charter - had a GREAT time. He was super patient with me and showed me exactly what to do to ensure I get that trout in the boat! My husband had an awesome time as well, can't wait to go back out and "catch fish"!!! Captain Eddie knows where to go and what to do to make sure you catch all you can. His equipment was awesome and he had everything you could even imagine on that boat! 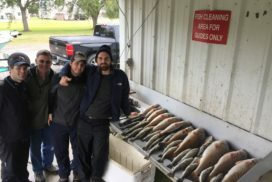 Best fishing trip ever! Our guide and boat captain, Eddie Berthelot was fun, safe and very knowledgeable! Looking forward to fishing with him again.